Home > Engineering and Technology > Which Type of Engineering Should You Study? 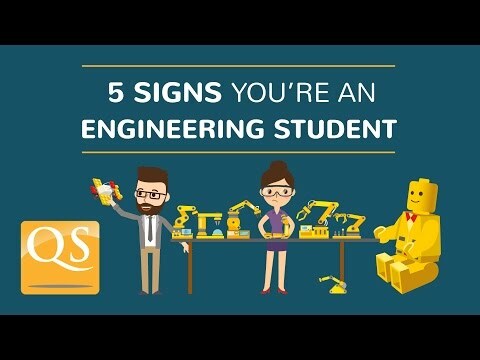 Which Type of Engineering Should You Study? Engineering is an extensive subject, and with so many types of engineering to choose from, it can be difficult to narrow down which one is for you. To help you to decide, you should try and identify what you’re passionate about. What gets you excited, and what do you spend your free time on? All types of engineering include some form of problem-solving (and generally focus on making life easier), but what engineering-related solution gives you the most buzz? If you choose a subject you’re naturally interested in, you’ll find it easier to stay motivated during your course, and stay involved with the subject whilst pursuing an engineering career. Here’s a rundown of the various branches of engineering, to help you decide which one could be for you. This branch of engineering deals with the research, design, development, construction, testing, science and technology of aircraft. You could also study astronautical engineering, focusing on spacecraft and the deep conditions of space. You’re fascinated by the history and methodology behind flying machines, from the earliest conceptual sketches to the advancement of modern jets. You have a keen interest in the mechanics of flight travel. You’re intrigued by computer simulation and in seeing how aircraft machinery performs under extreme conditions. If you study aeronautical engineering, you could specialize in aerodynamics, aeroelasticity, composites analysis, avionics, propulsion and structures and materials. Find out more here. This type of engineering concerns the use of chemical and biological processes to produce useful materials or substances. It’s a multidisciplinary subject, combining natural and experimental sciences (such as chemistry and physics), along with life sciences (such as biology, microbiology and biochemistry), plus mathematics and economics. You’re also considering studying chemistry or another natural/life science. You’re interested in the chemical processes behind producing everyday items. If you choose to study chemical engineering, you may like to specialize in chemical reaction engineering, plant design, process engineering, process design or transport phenomena. You can read more about these here. Civil engineering is the professional practice of designing and developing infrastructure projects. This can be on a huge scale, such as the development of nationwide transport systems or water supply networks, or on a smaller scale, such as the development of single roads or buildings. You’re interested in designing and building things. You’re interested in mechanics, hydraulics, geotechnics (using knowledge of the Earth’s crust to solve construction problems), materials science and statistical analysis. You’d like to develop your design skills, particularly in computer-aided design. Common specializations of civil engineering include structural engineering, architectural engineering, transportation engineering, geotechnical engineering, environmental engineering and hydraulic engineering. You can read more about these here. Computer engineering concerns the design and prototyping of computing hardware and software. This subject merges electrical engineering with computer science, and you may prefer to study computer engineering alongside one of these similar subjects. You’re interested in an engineering career related to computers – for example as a software developer or computer engineer. You’re interested in mathematics, science and computers, and want to learn more about how computers operate at a physical level. You want to produce new products and systems based on the technological advances of computer scientists. You may find that computer engineering specializations overlap with those offered in computer science degrees, for example with subjects such as computer graphics and network security. However, specialized subjects generally unique to computer engineering include microprocessor/microcontroller systems, computer architecture and VHDL (hardware description language) design. Electrical and electronics engineering both focus on applications of electrical power. The two fields differ in that electrical engineers chiefly focus on the large-scale production and supply of electrical power, while electronics engineers focus on much smaller electronic circuits, such as those used in computers. You’re interested in how electrical devices and systems work. You want to help power the next phase of technological developments. You naturally want to understand how any electrical system is set up and have ideas for how it could be improved. You could specialize in the following areas of electrical and electronics engineering: power generation and supply, communications and media, computer systems and robotic systems. You can learn more about these here. One of the oldest and broadest types of engineering, mechanical engineering is concerned with the design, manufacturing and maintenance of mechanical systems. You’ll study statics and dynamics, thermodynamics, fluid dynamics, stress analysis, mechanical design and technical drawing. You like fiddling with mechanical devices (you could also consider aeronautical engineering). You’re interested in coming up with new and innovative designs in fields such as sustainable energy and artificial intelligence. You’re interested in working as part of an interdisciplinary team to develop and improve mechanical technologies. This is a very broad subject, which overlaps with lots of other types of engineering. However, the most common specializations of mechanical engineering include manufacturing, transportation systems, combustion, nanotechnology and robotics. Mechatronics engineeringmay also be of interest; this combines mechanical and electronic engineering with areas such as computer and control engineering. Read more here. Another interdisciplinary field, engineering management has grown in recent years, with universities responding to industry demand for management-focused engineers by developing dedicated engineering management programs. These courses combine industrial engineering skills and business expertise, often developed jointly by the engineering and business faculties. You could also study one of the above branches of engineering with management. You’re interested in understanding how engineering is applied within different types of business, and the challenges involved in both technical and organizational terms. You want to quickly take on a managerial role, while also applying your technical knowledge. You want to oversee the development, manufacture, marketing and distribution of products. This is another broad area, but types of engineering management that you may like to specialize in include: engineering mathematics, management science, operations management, decision engineering, business statistics and engineering statistics. You can read more here. hey... I want to opt aeronautical engineering as my career.... So can you please help me to find best collage or universities for B-tech. Hi Pranay, here's a link to our latest subject ranking for aeronautical engineering. I was wondering about which engineer I wanted to be so I think this helped me very much and I'll study aeronautical engineer! Hi i have bachelor's degree , CERAMIC ENGINEERING, and look for an university to study my MD. Mechanical engineering is not the oldest discipline! Mechanical engineering branched off from Civil engineering. Civil is by far the oldest. Hi David, my mistake! I've now corrected the text. Thanks for pointing this out. HI I'm looking for masters in Avionics.Can any one let me know on area of studies to concentrate upon in grad level along with universities? I am ibdp student of applied science to be. Still got confused about applied science. So, is there any chance for me to further degree in engineering? I'am a second year elecetrical engineering student here in Papua New Guinea University of Technology and Iam very interested in securing a scholarship to study aboard.Can you help me out to find a scholarship?